The Young Collectors Auction is a unique auction experience and provides an unmatched platform for both aspiring and seasoned collectors. With the mandate of maintaining and promoting artistic excellence, the second edition of the Young Collectors Auction is sure to woo and delight audiences. Reinterpreting Contemporary is an exhibition that revisits the chapter of the Arab contemporary art scene and tries to decipher the cultural impact that manifested within the masses. This exhibition will try to display how certain artists are more conscious about art and visualize their profound understanding within their work. Work in Progress Nikki Diana Marquardt, presents “Heritage of Emotions” curated by Lara Saab explores the society’s unconscious and generates a renewed feeling of belonging and wanting to belong to the collective cultural memory and its aspiration to identify, redefine and refine this memory. From queries into the missing and misplaced artworks from Beirut’s national museum to a large graffiti display to a Walking tour of Beirut’s cultural history… all of this urges us to have a renewed spirit of pride and investment in our heritage and patrimony. The 2017 season will start with an exhibition around the works of the young Lebanese talent Ali Chaaban. At 25, Ali is already identified as one of the contemporary artists with the most interesting potential of the region. His work around nostalgia and exile will be complemented by an exclusive installation for the Cantine du Faubourg around the theme of the carpet. The group exhibition is co-curated by Noor Aldabbagh and Qaswra Hafez and introduces new emerging artists from Saudi Arabia alongside more established ones. 37 artists individually interpret 'flow' within their selves or as reflected in our societies, working within their practices in various contemporary mediums includingpainting, sculpture, photography, video, installation, textile art, ceramic, collage and others. Topics concerning the artists include migration, urban sprawl, dissemination of technology, spirituality, and the experience of memory. The Capital has opened doors to aspiring art collectors by putting up artworks that are affordable at the the city's annual art fair. The Galleries Week, a week-long event showcasing six galleries, opened to the public on Wednesday at Warehouse421 at Abu Dhabi's Mina Zayed Port. Visitors from across the country have been coming to see the art as well as listen to public talks on how to collect beautiful but affordable artworks. From September 19 to 26, BEIRUT ART WEEK continues its annual tradition of bringing contemporary art to the heart of Beirut. This unique, offsite program includes 27 offerings that highlight the cultural heritage of Beirut, deployed in public spaces and in some of the city’s most prestigious shops. This artistic circuit showcases important works including one by Romero Britto in partnership with the Beirut Marathon, in addition to the monumental sculptures of Mauro Corda and of Helidon Xhixha. An open-air cinema unfolds on the terraces of the Opera Gallery in collaboration with the Festival of Lebanese Film. Dedicated to short films, this projection pays homage to internationally renowned and awardwinning directors. Galleries Week first launched in 2017 as a collaboration between Warehouse421 and Abu Dhabi Art. It returns this year in expanded form through a new partnership with Festembr. 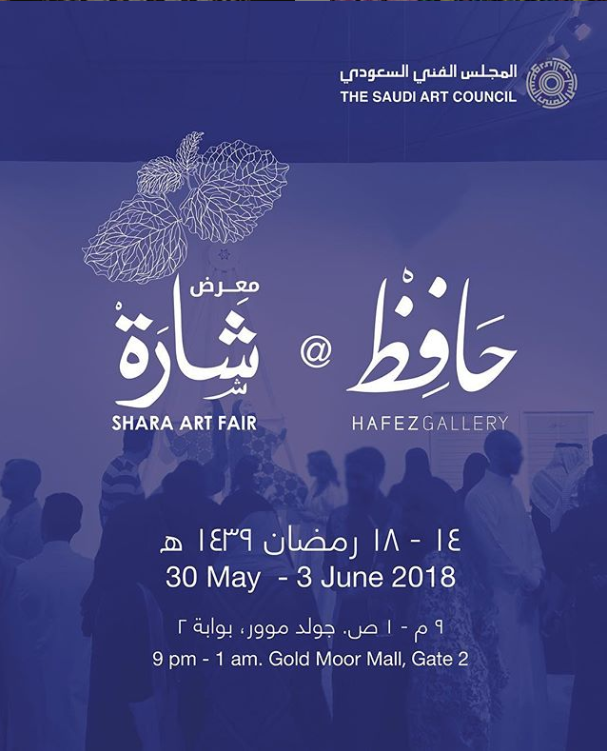 The Saudi Art Council conducted the 4th Edition of Shara Art Fair, at their headquarters in Gold Moor Mall at Zahra district, here. Shara Art Fair highlighted artistic works configured by several distinctive art entities, such as Al Mansouria Foundation gallery, Hafez gallery, Athr gallery, Ebdaa gallery and others. Abu Dhabi Art has announced the fourth in its series of gallery exhibitions in the capital presenting contemporary artworks for sale. 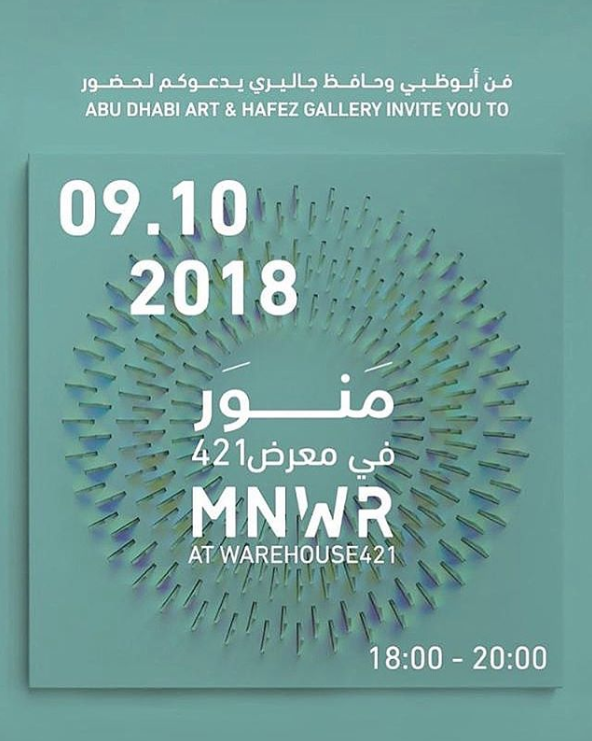 In collaboration with Jeddah’s Hafez Gallery, Abu Dhabi Art presents a group exhibition at Warehouse421 in Mina Zayed entitled MNWR (pronounced mun-wur), an Arabic term that denotes the flooding of light in a dark place. Among the participants are emerging and established artists Rashed Al Shashai, Sara Al Abdali, Ali Chaaban, Khalid Zahid, Nojoud Al Sudairi and Lulwah Al-Homoud. Invitée par la H Gallery, Olfa Feki, commissaire spécialiste du monde arabe, choisit d'exposer des artistes originaires du Maghreb et du Moyen-Orient. En provenance de différents horizons parmi le vaste monde arabe ; ces cinq artistes s'accordent dans une pratique qui porte un regard sur une commune “identité culturelle.” Pourtant, l'intitulé de l'exposition In Your Mind “dans votre tête/esprit” semble s'adresser au spectateur, ici parisien, comme pour l'inciter à s'interroger sur les stéréotypes identitaires auxquels il est lui même confronté. As with many of the works in the festival, the art itself pays homage to philosophical and spiritual thinking that characterises Islamic culture across time and geographies. Indeed, the festival’s catalogue statement describes the presentations as addressing both the visual and conceptual side of the subject. “The concept of art within the Islamic culture, is that it harmonises with Islamic thought. It reflects the absolute beauty [of God] within a visual yet abstract depiction.” Non-figurative is perhaps the one thread that would link all the pieces in the exhibition, but other than that, their influence is as broad as Islamic culture itself.